The PX409S Hygienic USBH Series connects directly to your computer. The Hygienic Series is U.S. 3A approved and available with 1½" or 2" Tri-Grip™ (Tri-Clamp® compatible) fittings to work with most common applications. Free software makes data logging and charting your readings a simple task. 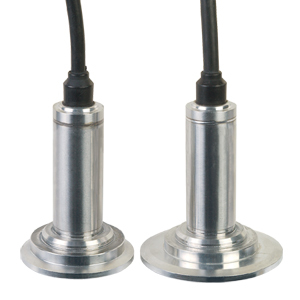 The micro-machined silicon design provides a very stable transducer with exceptional high accuracy of 0.08% typical and a broad compensated temperature range; it is ideal for pressure or level measurement in life science applications. Nota: Comes complete with 5-point NIST traceable calibration certificate, cable with USB connector, and free downloadable PC software.